"How to Rig an Election"
Nic Cheeseman is Professor of Democracy and International Development at the University of Birmingham. In addition to numerous book chapters, he is the author of Democracy in Africa: Successes, Failures and the Struggle for Political Reform. 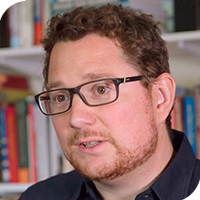 His research addresses a range of questions such as whether populism is an effective strategy of political mobilization in Africa, how paying tax changes citizens’ attitudes towards democracy and corruption, and the conditions under which ruling parties lose power. Nic is former editor of the journal African Affairs, ranked #1 in African studies, and the founding editor of the Oxford Encyclopaedia of African Politics, and the Oxford Dictionary of African Politics). He writes about contemporary events in Africa in Kenya’s Daily Nation newspaper. He also regularly provides analysis to the UK and US governments, and is an advisor to Kofi Annan's African Progress Panel. His new book, How to Rig an Election, looks at how democracy is being manipulated around the world by authoritarian leaders who use the facade of elections to keep themselves in power. With examples, from the UK, United States, Africa, Latin America and Asia, A.C. Grayling has described it as "Essential reading for everyone who wants to get democracy right again".